If you think your Jeep Grand Cherokee could use just a little more flash and sparkle, one way to enhance its style is with Mopar Chrome Mirror Covers from JustforJeeps.com. Install them on the front side of your outside rear view mirrors. 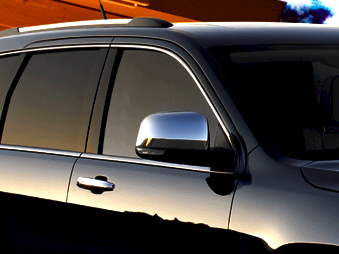 The Chrome Mirror Covers are compatible with Grand Cherokees built from 2011 forward. Now, every time you check the mirror while making a lane change, you'll be reminded of what a sharp-looking vehicle you are driving. Comes as a set of chrome mirror caps for left hand and right hand mirrors. Same as production Limited Mirror caps. These covers fit perfectly, look awesome! Make a Laredo look like a Limited. CHROME GRAND CHEROKEE MIRROR'S COVER PIECE. My question is when you buy them come both together or they need to be ordered separate left and right CHROME MIRROR'S COVERS. Perfect fit, easy to install, replaced OEM mirror trim. Good quality product and excellent customer service. Had a slight SNAFU and the team at Just For Jeeps took care of the problem right away! These look great on my 2015 Jeep GC. Install was a bit challenging but with the right tools and a little bit of patience I got the job done in about 30 minutes. Be careful with the removal of the mirror they seems like they'll break easily. Once I got two or three of the clips undone they popped right off no issue. After I did the passenger side I realized that the easiest way to get the old body colored covers off is to break a couple of the clips on them... so no going back I'll have to stick with the chrome but they went on and all five clips engaged perfectly. The appearance of a Limited for a fraction of the price. ProsThe price cant be beat and they look fantastic. ConsRemoving the mirrors was a bear and if you're not careful they could break. They look great on my 2015 GC - a very reasonably priced alternative to new mirrors! These mirrors are top of the line and look fantastic. Worth the money and effort of installation. ConsTaking off the stock covers was NO fun, five very uncooperative clips that will make your frustration level rise. Genuine mopar as stated . ProsThey fit like a glove. Looks perfect and was on my door step in three days! These mirrors were very easy to install and are the real genuine oem part. They look great on my 2011 jeep grand cherokee. Now if they would only make an upgrade for the chrome handles.